RKeepsakes creates personalized picture frames so that you can frame the memories that you have created in your life. We offer over 600 designs for various occasions. We help you to create a unique gift to someone special or for yourself. We wanted to provide you with high quality frames at affordable prices. R Keepsakes can provide you with a way to send high quality gifts to friends and family that have "meaning" attached to them. Please book mark us for when you need that last minute gift and uncertain of what to buy. Thank you for taking to time to visit our personalized picture frames! We can engrave logo's, special fonts or your own artwork. Each high quality frame includes engraving, glass, and a drop leg easel. All personalized picture frames are laser engraved which produces sharp lettering and crystal clear images. You will truly enjoy your personalized frame whether it is for yourself or someone special. We are adding new frames daily and would love the challenge of creating a specialized frame for you. Please send an email to RKeepsakes@yahoo.com with details of what you are looking for. Please be specific so that we can create something that is perfect. On most personalized frames, you can choose a font and size. For font samples, please visit our left navigation bar at the bottom or can CLICK HEAR. If the font you like is not listed on the font drop down ...Please make a note of the font name you would like in the customer comments section. You will also be given a choice of font size (small, medium & large). This provides our graphic artists with general guidelines of how you want your frame to look. 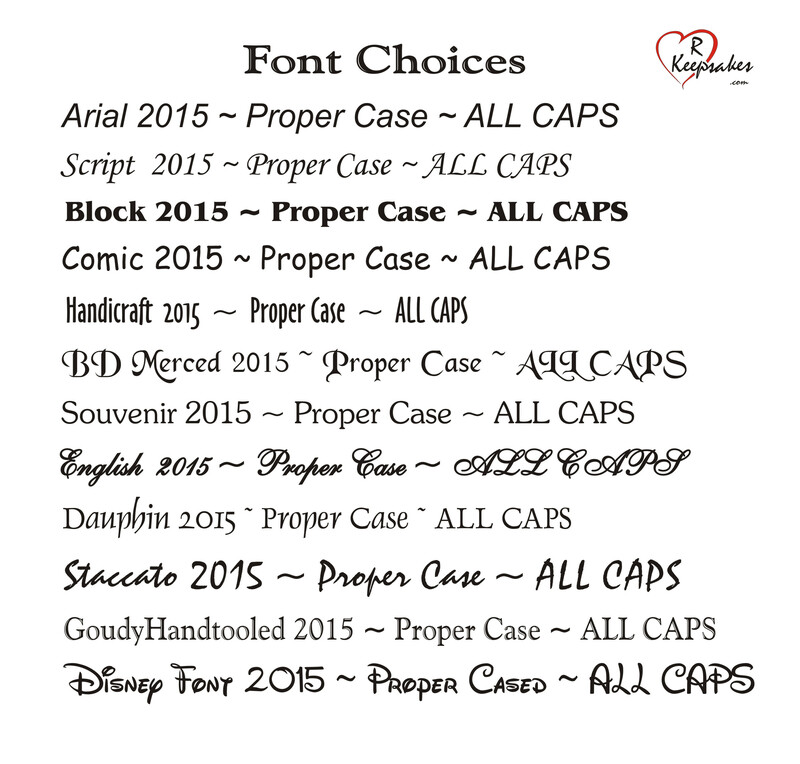 Keep in mind that it can vary by the amount of engraving you want done and by the font style selected. For example, it is easier to make one word large than a whole sentence. While we take into consideration font size, we also want to make sure your personalized picture frame is absolutely beautiful. Our script font does not look good in all CAPS so it will be changed to upper/lower letters for you if you ordered the script font in all CAPS. Most of our photo frames samples have a medium font size shown. We always tend to make the upper engraving a larger size than the lower engraving as shown on our samples. Please feel free to leave additional engraving instructions in the customer comments box when you check out. This information will help us when we prepare your personalized frame. The images displayed on our website are a photo of a real engraved frame. All orders placed will contain laser engraved text and graphics on our high quality wood picture frames. You can email your favorite photo to us and we will color print and include your photo in the engraved frame that you purchase as a gift. Once your order is placed, you will receive an email confirmation that can be used to reply and attach a photo. Please send high quality photos as we do not have the ability to take a low resolution photo and create a high resolution photo. Most cell phone photos are just fine. This is a great gift idea for Grandparents! For an additional $3.00 charge per picture frame, we can add a special message on the back of your engraved frame. This is a great gift idea to your recipient in that your engraved frame will be cherished for many years to come. If you choose this option, please enter your message in the gift message box when placing your order. If you would like to email us a picture, we can even color copy it and insert it in a frame for a gift. Please provide all photo's in JPEG format. You should send it to rkeepsakes@yahoo.com. Please remember to include your name, product and order number. Your photo will be color copied on high quality photo paper. Our orders ship generally next business day. RKeepsakes guarantees arrival via USPS Priority Mail. We will ship to any US Military APO address overseas. RKeepsakes utilizes the 256-bit secure encryption built into the secure checkout features of Yahoo. We have been an established Yahoo store since 2003. Yahoo Stores use SSL (Secure Socket Layer) encryption when transmitting certain kinds of information, such as financial services information or payment information. An icon resembling a padlock is displayed on the bottom of most browsers window during SSL transactions that involve credit cards and other forms of payment. Any time a Yahoo Store asks for a credit card number during checkout for payment, it will be SSL encrypted. Yahoo is certified CISP-compliant. Created by Visa and MasterCard, the Cardholder Information Security Program (CISP) outlines a standard for security procedures. Even the employees of this store cannot see all of your credit card information. All Illinois customers will be subject to Sales Tax. After you enter a coupon code, continue to the next page and your discount will be adjusted for you. Our goal is your satisfaction! We are confident that you will be thrilled with our products. Each frame is personalized so it is hard to provide a refund or exchange. We would be happy to exchange any item if you are not truly satisfied because of defects or workmanship. If we caused any error, we will happliy replace your item. Once your item is engraved, we can not correct any errors that was made on your part. PLEASE DOUBLE CHECK YOUR ENGRAVING INSTRUCTIONS. Every frame is inspected before being shipped. If you find that you are not satisfied due to defects in materials, please contact us for an exchange. We would be happy to accommodate your request. For custom orders or wholesale orders, please contact rkeepsakes@yahoo.com.